This paper presents an overview of the main advances in the Key Questions identified by the Task Group ‘What is the Solar Influence on Climate’ by the SCOSTEP CAWSES-II science program. We go through different aspects of solar forcing from solar irradiance, including total solar irradiance (TSI) and solar spectral irradiance (SSI), to energetic particle forcing, including energetic particle precipitation (EPP) and cosmic rays (CR). Besides discussing the main advances in the timeframe 2009 to 2013, we also illustrate the proposed mechanism for climate variability for the different solar variability sources listed above. The key questions are as follows: What is the importance of spectral variations to solar influences on climate? What is the effect of energetic particle forcing on the whole atmosphere and what are the implications for climate? How well do models reproduce and predict solar irradiance and energetic particle influences on the atmosphere and climate? The online version of this article (doi: 10.1186/s40645-014-0024-3) contains supplementary material, which is available to authorized users. The first Task Group of the SCOSTEP science program Climate and Weather of the Sun-Earth System–II (CAWSES-II), which ran from 2009 to 2013, was focused on solar influences on the Earth’s climate. This field has a long history starting from investigation of the impacts of variation in the total solar irradiance (TSI) to climate, but recently the major topics of research have extended to studies of solar spectral irradiance (SSI) variation and its impacts on the atmosphere and climate, as well as the impacts of energetic particles (including solar protons, energetic electrons from the magnetosphere and cosmic rays (CR)) on the atmosphere and the potential links to regional climate effects. A major landmark summarising our current understanding, particularly for TSI and SSI, was the publication of the review paper ‘Solar Influences on Climate’ (Gray et al. ), which was sponsored by SCOSTEP/ CAWSES-II to allow for open access. In this paper, we will focus on summarising the main advances following the publication of the comprehensive review paper for solar irradiance. As energetic particles were not comprehensively included in Gray et al. (), we will discuss advances in our understanding of the role of different types of energetic particles for potential regional climate variations. It is important to note that the topics included under the theme ‘What is the solar influence on climate?’ cover an extremely wide range of subjects, which for long have been the focus of scientific communities that were relatively separated from each other. The CAWSES-II period has seen these topics become closer with more active collaborations now taking place across scientific disciplines than before. Next, we will discuss separately the main achievements (reflecting the major questions) in the two topical groups solar irradiance and energetic particles. A comprehensive scientific review was recently given by Gray et al. () with further reviews, e.g. by Lockwood () and Ermolli et al. (). Therefore, here we will focus on an overview of the main advances during the period 2009 to 2013. We will discuss the advances on TSI and SSI separately. While this is somewhat an artificial differentiation for the solar irradiance inputs to the climate system, it allows us to clearly distinct the advances on the two topics. TSI is the best known source of solar forcing into the Earth’s atmosphere and provides the energy needed for the climate system. 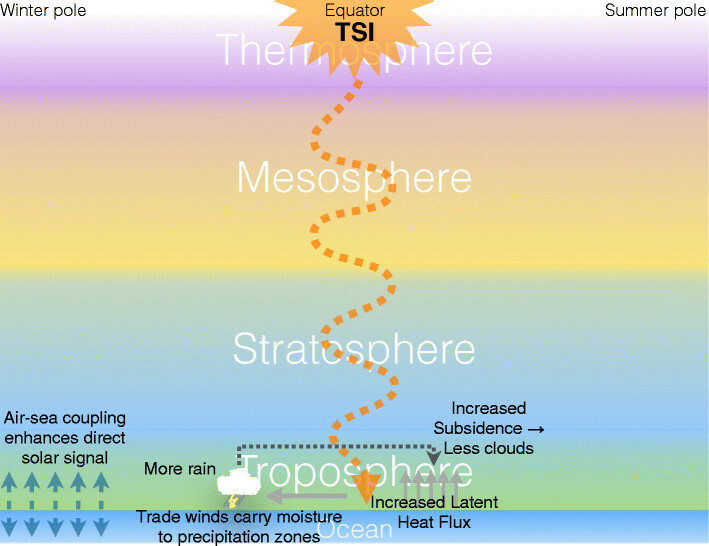 TSI impacts the surface directly influencing the atmosphere above via the so-called bottom-up mechanism (see Gray et al. for further references), which we will summarise briefly in the following. The bottom-up mechanism (see Figure 1) involves solar radiation being absorbed over the oceans, leading to increases in evaporation with the increased moisture converging in the precipitation zones. This further leads to changes in precipitation patterns and vertical motions, influencing the trade winds and ocean upwelling. A demonstration of this effect is stronger Hadley and Walker circulations and associated colder sea surface temperatures for solar maximum. The bottom-up mechanism for total solar irradiance (TSI). Main features of the bottom-up mechanism. Based on Gray et al. () and Meehl et al. (); see these references and text for more details. This figure, as well as the following figures, presents a pole-to-pole latitudinal cut showing the layer structure from the oceans to atmospheric layers covering the altitudes from the troposphere to the lower thermosphere. The winter and summer poles and the equator have been marked at the top. TSI and solar cycle variation in TSI are the main solar influence thus far regarded in the Intergovernmental Panel on Climate Change (IPCC) Assessment Reports (IPCC ) and included in climate models. In the latest IPCC Fifth Assessment Report (AR5) (IPCC ), some climate model simulations utilised the new lower TSI value (Kopp and Lean ) of 1,361 Wm −2. The new recommended TSI value was based on observations from Total Irradiance Monitor (TIM) onboard NASA’s Solar Radiation and Climate Experiment (SORCE) satellite. The new estimate for the global radiative forcing from TSI has been decreased since earlier IPCC reports and is on a global mean basis very small with 0.05 Wm −2 (relative to year 1750). Accordingly, solar effects on global temperatures are very small, and hence solar forcing cannot account for the overall warming trend in global mean air surface temperatures in the past 25 years and contributed only about 10% in the past 100 years (e.g. Lean and Rind ). Recent studies by, e.g., Imbers et al. () support the robustness of these small solar forcing contributions to climate change and provide statistical evidence that human-induced changes to atmospheric gas composition are affecting global mean air surface temperatures more than natural forcings, such as solar and volcanic. Following the relatively high solar activity over the past decades and the low solar minimum experienced between 2008 and 2009 (Schrijver et al. ), a new interest has risen in the potential climate impacts of TSI changes from future solar grand minima. Jones et al. () examined the potential climate change mitigating effects from a future solar grand minimum using a simple climate model. They found that by 2100, the reduction in TSI would likely only count to a <0.1 K reduction in the global mean surface temperatures, a small fraction of the predicted warming from anthropogenic forcing. Similar scale results indicating a temporary slow down, but not stopping of global warming, were obtained by Meehl et al. () who applied a Maunder minimum-type reduction in future solar activity to a global coupled climate model. While the works of Jones et al. () and Meehl et al. () suggest small impact of future solar extreme minima to global temperatures, it is interesting to also note that results reported by Martin-Puertas et al. () suggest that abrupt changes in atmospheric dynamics have occurred as a response to solar minimum events in the past, although these changes were linked not to TSI but to the solar spectral irradiance, discussed in the following section. As mentioned above, the CAWSES-II period saw a shift in focus from TSI to investigations of the influence of SSI. At the same time, more research focus has turned towards regional climate responses, rather than global responses, since several studies highlighted the importance of solar forcing for regional climate variability (e.g., Kodera and Kuroda ; Matthes et al. ; Lean and Rind ; Ineson et al. ; Martin-Puertas et al. ). SSI variations with the solar cycle are much larger than TSI variations and reach about 5% between 200 and 300 nm, the wavelength range important for middle atmosphere heating and ozone chemistry (Haigh ). 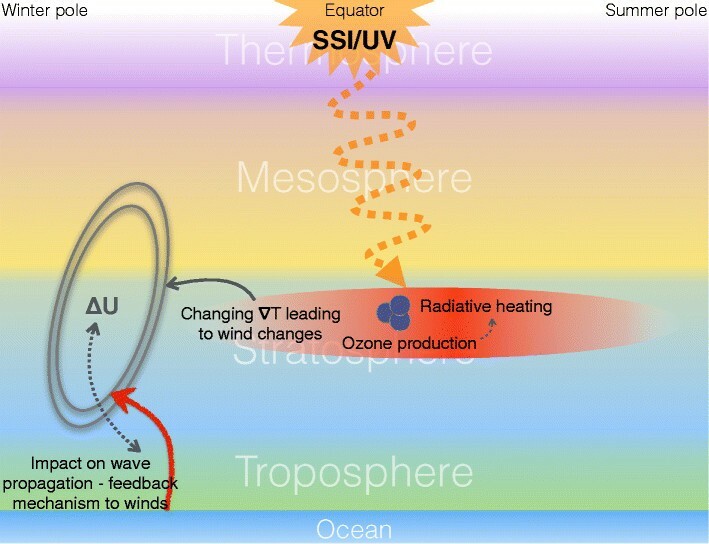 In the Earth’s atmosphere, SSI forcing plays a key role in chemical-dynamical coupling via its interactions with atmospheric ozone and as a main driver in the so-called top-down mechanism connecting the stratosphere to the underlying tropospheric climate (see Gray et al. ). Besides a number of evidences for the top-down mechanism from observational as well as modelling studies, the interest in SSI was partially also fuelled by the results from the SORCE mission, which suggested much larger variability in the solar ultraviolet (UV) spectrum, as well as changes across the wider solar spectrum, which the new observations suggested were out or phase with the 11-year solar cycle (Harder et al. ). It should be noted that the SORCE results were in such contrast to previous long-term observations that a question on potential instrumental degradation that might be affecting the SORCE instruments, as well as previous missions, has been considered, and recent reanalysis of the SORCE data now suggest a smaller variability (Ermolli et al. ). Ermolli et al. () highlight the differences between the SORCE observations and the existing models, when it comes to both variability during the solar cycle and relative contribution to the TSI from the afferent wavelength ranges. The SORCE data, which mainly covered the declining phase of solar cycle 23, showed significant deviations from the most commonly used SSI models in climate simulations, highlighting the need for further SSI missions to resolve the questions which remain on the SSI variations across the solar cycle. The top-down mechanism originates in the stratosphere where UV radiation modulates local radiative heating at the tropical stratopause. Simultaneously, there is a direct effect on ozone production rates in the upper stratosphere through the SSI variation impact on UV photolysis of O 2, a key ingredient for ozone production. Since ozone is an important element for the radiative heating, this creates an additional feedback mechanism to the radiative heating impact. The radiative heating changes, both from the direct heating and the ozone feedback, are focused on the low-latitude (equatorial) stratosphere. Changes in heating in the equatorial region affect the equator-to-pole, or meridional, temperature gradient, which the atmosphere attempts to stabilise through the thermal wind balance (Holton ), resulting in modulation of the zonal wind, i.e. a west wind anomaly in the subtropical upper stratosphere. These westerly winds change the propagation properties for planetary waves and change atmospheric wave-mean flow interaction (see Figure 2). 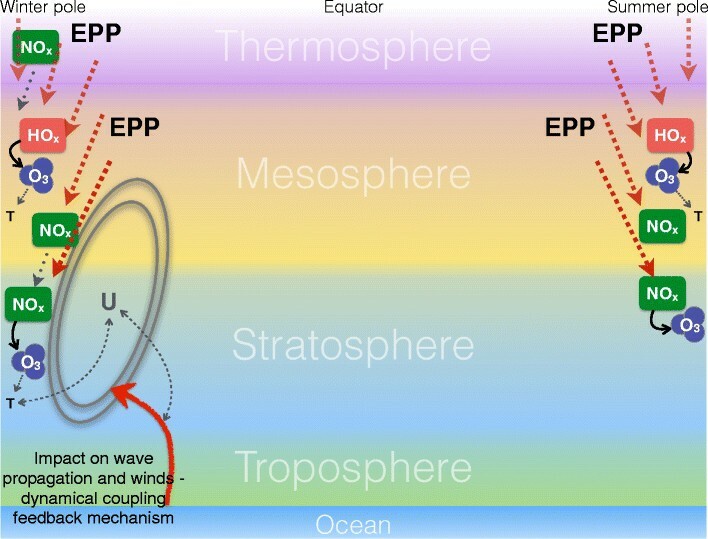 The impact on wave propagation provides yet again another positive feedback mechanism enabling poleward and downward movement of the wind anomalies in the stratosphere (Kodera and Kuroda ; Matthes et al. ), and down to the Earth’s surface where they project onto tropospheric circulation patterns like the Arctic Oscillation (AO) and the North Atlantic Oscillation (NAO) (e.g., Gray et al. ; Woollings et al. ; Scaife et al. ; Gray et al. ). Woollings et al. () showed a statistically significant positive NAO signal consistent with more blocking events during solar maxima when using the open solar flux which is lagged to the commonly used F10.7 cm solar flux by a few years. Using the F10.7 cm solar flux index, Scaife et al. () and Gray et al. () recently suggested that there could be a 3- to 4-year lag in the North Atlantic region surface climate response due to the feedback of atmospheric circulation with the Atlantic Ocean and subsequent anomalies in the ocean heat content which is consistent with the earlier findings of Woollings et al. (). The top-down mechanism for solar spectral irradiance (SSI). Main features of the top-down mechanism with feedback systems are indicated with dashed lines. Based on Gray et al. (); see text for more details. The importance of improving the SSI forcing estimates can be seen from climate model experiments, which have estimated the atmospheric impact of the larger SORCE SSI variability in comparison to previously existing SSI estimates. Haigh et al. () showed that the difference between near solar maximum and solar minimum ozone concentrations in the middle stratosphere was more than doubled when using the SORCE spectrum, while in the upper stratosphere, the impact was opposite to those from the prevailing SSI model inputs. A further study by Ineson et al. () suggested that if the SORCE SSI observations were the true representation of the UV variability, regional winter climate in the Northern Hemisphere could be significantly affected by the solar cycle, with little impact on global average temperatures. The currently available SSI forcing data sets are summarised by Ermolli et al. (). They also report on the differences in the atmospheric impact from the most commonly used SSI data set in current climate model simulations, between the NRLSSI (Lean ) and the SORCE SSI data. The results show that the solar cycle difference in atmospheric heating is much larger (by a factor of 2) and the resulting stratospheric temperature differences more pronounced when the SORCE SSI data is used. Merkel et al. () used the Whole Atmosphere Community Climate Model (WACCM) to compare the solar ozone response to the SORCE SSI observations and the NRLSSI (Lean ) reconstructions and extended their focus to the mesospheric responses, whereas previous studies mainly focused on the stratosphere. The comparison of the model results to 8 years of satellite ozone observations showed that the observed solar cycle variation in ozone at higher altitudes was better captured by the simulations using the SORCE SSI variability than the simulations using the NRLSSI reconstruction. However, the results have to be handled with care as they not even include one full solar cycle. Finally, Ermolli et al. () highlight that while the solar-induced changes were of minor importance for global average temperatures, they lead to large regional responses. Most climate models participating in the IPCC Assessment Reports used TSI solar forcing only resulting in small and insignificant solar radiative forcing and small contributions to climate variability from the Sun. Recently, more groups also included SSI forcing, which requires a well-resolved shortwave radiation scheme (not standard in many climate models) to prescribe the wavelength-dependent irradiance changes. An ongoing intercomparison of solar signals in the CMIP5 (Coupled Model Intercomparison Project Phase 5) simulations confirms the need to include the SSI forcing, the ozone effect (either prescribed or interactively calculated) and a reliable background climatology in order to understand and simulate the regional responses to solar activity (D. Mitchell, S. Misios, L. Hood, personal communication, 2014). Inclusion of SSI forcing and therefore solar-induced regional climate effects also has the potential to improve seasonal- to decadal-scale predictions and is therefore of great importance for future climate modelling efforts. A key for understanding the importance of SSI variations to the climate system, and particularly to regional climate effects arising from solar forcing in general, is the establishment of the top-down mechanism during the CAWSES-II period (Gray et al. ). Furthermore, it has been recognised recently that in order to understand the solar signals in observations, both the TSI-driven bottom-up and the SSI-driven top-down mechanisms need to be included in climate modelling studies. This is also reflected in the Fifth IPCC Assessment Report (IPCC ), which states that while the role of solar forcing in the observed global climate change is likely to be small, there is a possibility that regional impacts on climate are not well reflected by the utilised solar forcing, i.e. TSI only. Further recent reviews on the SSI (and TSI) impact on the atmosphere can be found from Gray et al. (), Lockwood et al. () and Ermolli et al. (), and more information on the ongoing World Climate Research Programme core project SPARC (Stratosphere-troposphere Processes and their Role in Climate) SOLARIS-HEPPA activity, which includes both TSI and SSI, is available from http://sparcsolaris.geomar.de. 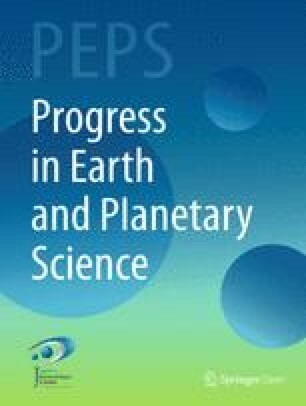 A major development during the CAWSES-II period for studies of energetic particle precipitation effects on the middle and upper atmosphere was the shift of focus from the previously dominant topic of solar proton events (SPE) to investigations including energetic electron precipitation (EEP). These two topics are joined under the terminology energetic particle precipitation, EPP. Significant advances were also made in the field of cosmic rays. These are also energetic particles, but as the effects of cosmic rays, due to their much higher energies, are focused on the lower atmosphere, for clarity, we will discuss EPP and CR separately. The combined effects of EPP and cosmic rays are briefly addressed in the latter section. Charged protons and electrons with high energies originating from the Sun or the Earth’s magnetosphere enter the atmosphere in the polar regions, where they are guided by the Earth’s magnetic field. Once in the atmosphere, they increase the ionisation levels, providing a major source of ionisation in the mesosphere and upper stratosphere. The typical energies of EPP particles range from 1 MeV to a few hundred MeV for protons, and from tens of keV to a few MeV for electrons (Turunen et al. ), energies above these are usually regarded to be in the cosmic ray energy range. In the atmosphere, the enhanced ionisation from EPP leads to production of HO x and NO x , reactive gases which have an important role in middle atmosphere ozone balance, thus providing a potential link to dynamics and regional climate as discussed in a recent review article by Rozanov et al. (). The earlier focus on SPEs (Jackman and McPeters ; Jackman et al. , , ) has recently seen a shift with increasing interest in the potential impacts of auroral, medium- and relativistic-energy electrons. SPEs are now considered as more of an extreme event, while electron precipitation is almost always present at some level. However, SPEs and particularly the combined roles of SPEs (and EPP) and exceptional dynamical events following sudden stratospheric warming events (Randall et al. ; Holt et al. ; Päivärinta et al. ; von Clarmann et al. ) have provided a wealth of information on EPP impacts on atmospheric chemistry. Model simulation experiments using the WACCM looked into the long-term (months to years) impacts of SPEs on the atmosphere from a period where reliable observations of SPEs exist (Jackman et al. ). While the impact on stratospheric ozone levels (from SPEs only) was found to be long lasting and significant (>10% stratospheric ozone loss up to 5 months past the event), the simulated long-term impacts on polar annual mean total ozone and temperature were not significant. Funke et al. () performed a comparison between satellite observations of atmospheric chemistry response to the 2003 October-November SPEs and the responses of nine different chemistry-climate models and chemistry-transport/general circulation models within the SOLARIS-HEPPA - Solar Influences for SPARC Model-Measurement Intercomparison (MMI) community effort. Overall, the models were found to reproduce the observed ozone loss reasonably well, but issues were identified regarding the used ionisation rates for the proton forcing in the models as well as the need to implement additional ion chemistry into the models’ chemical schemes. The authors concluded that ‘…the intercomparison has demonstrated that differences in the meteorology and/or initial state of the atmosphere in the simulations cause a relevant variability of the model results, even on a short timescale of only a few days’. With increasing interest in electron precipitation at energies high enough to impact the mesosphere and upper stratosphere directly, in addition to the now well-understood source of SPEs, one of the key issues has turned out to be how to estimate the electron input at these energies (approximately 100 keV to few MeV) into the atmosphere. For SPEs, proton forcing (proton flux) information exists readily from the NOAA (National Oceanic and Atmospheric Administration) geostationary GOES (Geostationary Operational Environmental Satellite) satellites (Jackman et al. ). For electron fluxes, the situation is more complex due to the lack of continuous observations of i) precipitating electrons in the bounce loss cone and ii) electron fluxes at right energies (Rodger et al. ). Furthermore, unlike proton precipitation from SPEs, electron precipitation does not take place homogeneously (or close enough) across the polar cap, but is tied to a range of geomagnetic latitudes around the auroral oval and the radiation belts (Rodger et al. ) and is driven by a range of processes governed by wave-particle interactions in the Earth’s magnetosphere (Thorne ), which in itself is a major research topic in magnetospheric physics. Faced with these difficulties, the model simulation studies aiming to assess the impact of electron precipitation, or the combined EPP impact on the atmosphere, have been limited to using current best estimates for electron precipitation. For most studies, the best estimates for electron precipitation have come from the NOAA POES (Polar Operational Environmental Satellite) satellite observations (e.g. Codrescu et al. ; Semeniuk et al. ) or from semi-empirical geomagnetic activity-based parameterisations for NO x production (Baumgaertner et al. ; Rozanov et al. ), although the latter responds strongly not just to NO x produced by EPP in the upper mesosphere, but also to NO x produced by EPP in the thermosphere and transported downwards (Randall et al. ; Holt et al. ; Funke et al. ). The use of the POES observations also has problems as highlighted by Rodger et al. (): During geomagnetically disturbed times, i.e. when electron precipitation is likely to occur, up to 55% of the POES bounce loss cone electron flux (electrons precipitating into the atmosphere) observations are contaminated by energetic protons. Even in quiet periods, nearly 30% of the highest energy channel (>300 keV, producing peak ionisation at about 65 km) precipitation measurements were found to be potentially contaminated. Thus, the use of any POES observations as a measure of electron precipitation into the atmosphere needs to be carefully considered. In order to constrain the POES observations, Clilverd et al. () have demonstrated the potential of using ground-based observations of changes in ionospheric D-layer ionisation (VLF, very low frequency radio propagation) to establish near-real-time electron precipitation fluxes. For the time being, inclusion of electron precipitation and thus full EPP forcing in model simulations is yet to reach the same routine approach as solar protons (SPEs). While the inclusion of full EPP description still requires further work, and potentially improved satellite missions, the impacts of particles in model simulations have been advanced via improved ionisation and HO x and NO x production calculations. Verronen and Lehmann () provided new parameterisation of ionic reactions affecting HO x and NO x production. Friederich et al. () calculated altitude-dependent NO x lifetimes and production rates from satellite observations. Several studies addressed the question of the role of transported NO x for the stratosphere. This is known as the EPP indirect effect or EPP IE (Randall et al. ). The EPP IE has the potential to bring large amounts of NO x produced in the lower thermosphere-mesosphere region down to the stratosphere, as low as 22 to 25 km altitudes (Rozanov et al. ; Funke et al. ), within the polar vortex. In the Northern Hemisphere, large NO x descent events have been linked to elevated stratopause events following some sudden stratospheric warming events (Randall et al. ; Päivärinta et al. ; Funke et al. ), when the stratopause is reformed after the warming event but at altitudes much higher than normally, around 80 km (Holt et al. ). In the Southern Hemisphere, strong descent inside the polar vortex is observed annually (Randall et al. ; Funke et al. ). The impact of the transported NO x on stratospheric ozone levels has been more challenging to estimate from observations due to ozone being impacted by both chemistry and dynamics (see Päivärinta et al. and references therein). However, localised ozone losses in the middle stratosphere of up to 40% to 60% have been inferred from correlations of observed EPP-NO x enhancements and ozone depletions (Randall et al. , ). Recent model simulations (Rozanov et al. ) have suggested up to 10% to 12% reductions of polar upper stratospheric ozone on monthly scales. Lower down, between 20 and 30 km, polar ozone losses of 3% to 6% have been predicted on annual scales (Rozanov et al. ). For the total ozone column, the impacts from EPP are estimated to be significantly smaller than the well-known ozone loss arising from atmospheric halogen loading (Jackman et al. ). It should be noted that the EPP-NO x can also have an ozone-increasing effect in the lower stratosphere where the NO x can remove some of the actively ozone-destroying chlorine and bromine species by converting them into chemically less active reservoir species (Jackman et al. ). With the EPP impact on ozone, earlier model simulations (Rozanov et al. ) suggested that further chemical-dynamical coupling may lead to indirectly EPP-driven regional signals even at polar surface levels. The potential mechanisms remain under investigation, but several studies have found similar response in meteorological reanalysis data and the coupling from EPP to dynamical variables has been addressed by several model simulations. Seppälä et al. () analysed meteorological reanalysis data and found statistically significant responses at surface air temperatures which corresponded to the earlier simulated results (Rozanov et al. ). A number of studies based both on model simulations and reanalysis data have provided further evidence for implications to the strength of the wintertime stratospheric polar vortex via modulation of atmospheric wave propagation (Lu et al. ; Seppälä et al. ) (see Figure 3) and links to the annular modes at both hemispheres (Li et al. ; Baumgaertner et al. ; Lu et al. ). Common to all studies, the main effects on the lower atmosphere appear to be limited to the winter season, and the surface level responses have been found to be of regional rather than global scale. Energetic particle precipitation (EPP) impact on the atmosphere. Main direct and indirect impacts from EPP (including EEP and SPE). EPP ionisation is focused on the polar regions leading to production of HO x and NO x shown in the figure. Transport processes are shown with grey dotted lines, while coupling mechanisms are indicated with grey dashed lines. Direct chemical impacts are shown with black arrows. Further recent reviews on the topic of EPP impact on the atmosphere are also available (Rozanov et al. ; Sinnhuber et al. ; Krivolutsky and Repnev ), and more information on the ongoing SOLARIS-HEPPA SPARC activity is available from http://sparcsolaris.geomar.de. Cosmic rays, including both solar energetic particles (SEP) and galactic cosmic rays (GCR) are the main source of ionisation in the troposphere, peaking at about 15 km altitude (see Figure 4). A number of publications have studied the effects of transient solar events (SEP or ground level enhancement (GLE) of CR) on the lower stratosphere and upper troposphere in the polar regions (Calisto et al. ; Mironova et al. ; Mironova and Usoskin ; Mironova and Usoskin ; Usoskin et al. ), including calculation of atmospheric ionisation from nearly all GLE events since 1956. The results indicated that there is no straightforward relation between the strength of the GLE events (as measured by neutron monitors) and the ionisation effect in polar atmosphere. Cosmic ray (CR) impacts on the atmosphere. 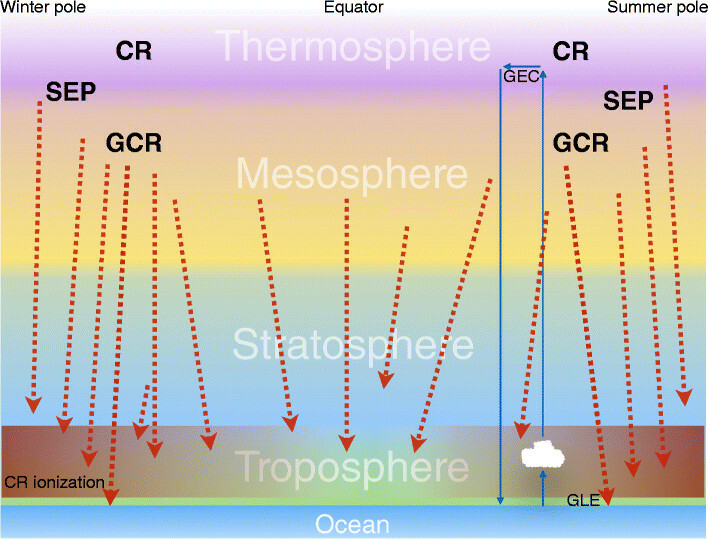 Main CR (including SEP and GCR) influences on the atmosphere. CR are the main source of ionisation in the lower atmosphere. The shading depicting the main region of this ionisation also shows that the CR ionisation is focused on the polar regions (Usoskin et al. 2011). Note that the GEC is distributed over the whole Earth. The net atmospheric ionisation effect from CR is defined by an interaction between the SEP event itself and the so-called Forbush decrease, a rapid reduction in GCR intensity following coronal mass ejection (CME). This interaction makes it difficult to utilise regression or superposed epoch analysis in statistical studies of cosmic ray events. Reflecting this, atmospheric impacts of individual GLE events were analysed for 1989 (Mironova and Usoskin ), 2005 (Mironova et al. ), and 2000, 2001 and 2003 (Mironova and Usoskin ). The results suggested that an enhancement of ionisation rate by a factor of about 2 in the polar region with the night/cold/winter conditions can lead to formation or growing of aerosol particles in the polar middle stratosphere. The effects were accompanied by decreasing of the temperature, and the authors found that extra aerosol mass occurs and attribute most of the changes to the ion-aerosol clear sky mechanism. However, the effect of the additional ambient air ionisation on the aerosol formation was minor. The atmospheric chemistry impacts from the ground to 80 km altitude of a major SPE event and the associated CR for a theoretical event similar to that of the 1859 Carrington event were examined using a chemistry-climate model (CCM) (Calisto et al. ). The combined effects of EPP and CR showed significant impacts on atmospheric NO x , HO x , ozone, temperature and zonal winds for several weeks following the event. The results suggested that a major future event of similar scale could potentially impact the total ozone levels in polar regions with reductions of up to 20 DU. Further work with two different CCMs was done to evaluate the wider effects from CR (also including EPP) (Rozanov et al. ; Semeniuk et al. ; Calisto et al. ). A review by Rozanov et al. () examining the potential impacts on both atmospheric chemistry and some climate variables concluded that at least in the model (CCM SOCOL), the combined effects of GCR, SPEs and EEP can potentially affect not just the chemical composition but atmospheric dynamics as well. The predicted long-term (months) ozone changes were up to 3% in the troposphere and up to 8% in the middle stratosphere. For comparison, on annual scales, stratospheric ozone changes were predicted to be of the order of 2% to 6%, while those arising from solar UV variation are of the order of 2% to 4%, with the combined GCR + SPE + EEP ozone losses peaking at high latitudes. While the same GCR ionisation (Usoskin et al. ) calculation was used in all studies, Semeniuk et al. () examined the atmospheric response from the different particle forcing sources (EEP, SPE, GCR) separately as well as together to estimate their relative roles. The results suggested that the frequently observed deficit of lower stratospheric NO y in CCMs could partially be explained by the missing GCR source of NO y (Semeniuk et al. ). The question about potential GCR impacts on cloud cover via atmospheric aerosol particle formation by GCR ion production has been long debated. Atmospheric ground-based data over a solar cycle (Kulmala et al. ) was used to investigate the role of GCR-induced ionisation on atmospheric aerosol formation rates. The study concluded that ion-induced formation typically contributed less than 10% to aerosol particle formation, explaining the missing correlation between cosmic ray-induced ionisation intensity and aerosol formation. Other studies have utilised satellite-based climatologies (e.g. Čalogović et al. ) as well as meteorological reanalysis (e.g. Laken et al. ). Laken et al. () took a critical look at the consistency of the mathematical methods used for signal detection when looking at the GCR-cloud links. The issues in detecting any GCR influence on cloud and meteorological parameters were also discussed by Laken et al. (, ). An important question lies in understanding the physical mechanisms through which CR-induced ionisation could affect atmospheric aerosols. Several studies were conducted to assess this in atmospheric aerosol models (Pierce and Adams ; Kazil et al. ; Snow-Kropla et al. ; Dunne et al. ; Yu et al. ), with the prevailing conclusion that while there appears to be a change in cloud condensation nuclei concentration as a response to variation in CR intensity, the effect is relatively weak, and the associated uncertainties in the models are larger than the simulated effects. To look further into the possible mechanisms linking the GCR ionisation and cloud formation to better understand the influence on climate, an experiment using a cloud chamber was arranged at the CERN Proton Synchrotron facility (Kerminen et al. ). The Cosmics Leaving OUtdoor Droplets (CLOUD) experiment focused on investigating the cloud condensation nucleation mechanisms from sulphuric acid, ammonia and the role of GCR ionisation. The first campaign, which included investigations to cosmic ray influences, took place in 2010. A second CLOUD campaign without GCR focus was organised in 2011. The first results (Kirkby et al. ) indicated that at certain conditions, ions were able to increase the nucleation rate by an additional factor of 2 to >10 at ground-level GCR intensities, although the CERN results are not yet directly transferrable to the real atmosphere. Further model simulations suggested that while the model predicted a 0.15% decrease in global mean cloud condensation nucleus concentration at the surface, no significant response was detected in concentrations of cloud condensation nuclei >70 nm. This suggested that changes in large-scale nucleation rate could not explain the correlation between variation in cosmic ray ionisation and any cloud or aerosol properties (Dunne et al. ). Another potential mechanism linking cosmic rays and clouds has been suggested to involve the global electric circuit (GEC). The weak electrical current of the GEC has its origins in the vertical movement of atmospheric ion clusters produced by GCR ionisation. The vertical movement of the ions, on the other hand, is caused by the potential difference between the Earth’s surface and the ionosphere (Gray et al. ). The proposed mechanism influencing clouds involves cloud microphysical effects from cloud dropped charging driven by changes in the GEC (Rycroft et al. ). Nicoll and Harrison () showed ground-based experimental confirmation of cloud edge electrification using a specially designed sensor providing support for earlier hypothesis on potential links between GCR and lower atmosphere processes. AS gratefully acknowledges funding from the Finnish Academy (Projects #258165 and #265005 CLASP). KM acknowledges support from the Helmholtz-University Young Investigators Group NATHAN funded by the Helmholtz Association through the Presidents Initiative and Networking Fund and the GEOMAR Helmholtz Centre for Ocean Research Kiel. CER gratefully acknowledges funding from NASA Living With a Star (programs NNX14AH54G and NNX10AQ54G) and NSF program AGS 1135432. IM acknowledges support from RFBR (grant N13-05-01063A) and useful discussions within the ISSI Teams on ‘Study of Cosmic Ray Influence upon Atmospheric Processes’ and ‘Specification of Ionization Sources Affecting Atmospheric Processes’. AS and IM would like to thank Japan Geoscience Union for providing travel support for their attendance of the CAWSES-II symposium in Nagoya. We gratefully acknowledge the support from the European Union COST Action ES1005 TOSCA (http://www.tosca-cost.eu) and the SPARC/SOLARIS-HEPPA activity. AS lead the writing of the review. KM, CER and IAM provided contributions to the individual review sections. All authors read and approved the final manuscript.